Three years after discovering that a single, unidentified mechanism was modifying about 800 proteins simultaneously during cell division, Florida State University researchers have identified that mystery enzyme. It’s TOPK, an enzyme that belongs to the family of protein kinases — which orchestrate much of the networking and signaling in cells. The discovery, led by College of Medicine researcher Raed Rizkallah in the Department of Biomedical Sciences, is significant because it advances our understanding of cell division and could lead to therapies that pinpoint cancerous cells without destroying healthy ones. 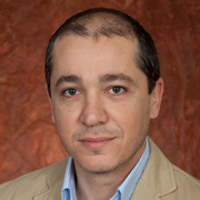 Rizkallah, who works with Hurt, also collaborated with the medical school’s Translational Science Laboratory and FSU’s Department of Chemistry and Biochemistry. The paper appeared in the online edition of Oncotarget, a specialized journal that publishes cancer-related research. Other researchers had detected TOPK at high levels in many types of cancer, but Rizkallah is the first to identify its functional significance to dividing cells. Proteins are the workhorses in cells, according to Rizkallah. So it was a challenge to learn the identity of this “master mitotic regulator” that can modify such a large family of proteins at the same time. Rizkallah used a fishing analogy to describe his work. Next, he needed the cutting-edge help of the mass spectrometer in the Translational Science Lab, which analyzed exactly what was in the purified complexes. Then Rizkallah went down a list of 40 to 50 candidate proteins, comparing each one with what he knew about Enzyme X. Finally, he concluded that Enzyme X was actually TOPK. Now he’s following up on how TOPK is activated and how it’s regulated in cancer cells.